Trainer Dan Bowen is confident Hope Island can bounce back to his best form and upset more fancied rivals when he returns to his home track at Lismore on Tuesday. 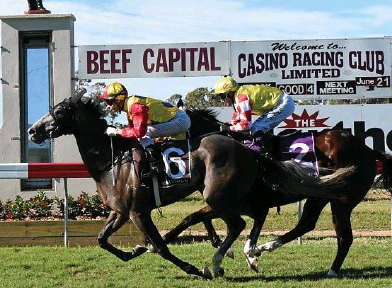 Hope Island hasn't fired in his past three starts at Glen Innes, Grafton and Ballina, but he has never run a bad race at Lismore and Bowen said the six-year-old 'maps perfectly' for Tuesday's Tursa Employment & Training Benchmark 66 Hcp over 1516m. "Looking at the speed in the race, there are four runners who all go forward so there could be a speed battle up front and my horse should get a lovely run camped in behind them," said Bowen. "I'm very confident he can run a big race at good odds ($10 on TAB fixed odds) in Tuesday's race." Very firm tracks have played a part in Hope Island's recent disappointing runs, but the return to Lismore and the prospect of a soft track (currently a soft 5) on Tuesday could see him turn things around. "He's spot on for Tuesday's race and the 1516m really suits him," said Bowen. "And he's never run a bad race here at Lismore. He has only been unplaced here once and that was a fourth in the Rousillon a couple of years ago when he had no luck and should have won the race." Hope Island has had eight starts at Lismore for a win, six placings and his luckless fourth (beaten three-quarters of length) to On Demand in the 2017 Rousillon Hcp over 1516m. His most recent Lismore appearance was four starts back on December 29 when he carried 64kg to victory in a Benchmark 58 Hcp over 1205m. Hope Island will face only six rivals in Tuesday's race, including in-form Grafton galloper Cool Prince ($2.50), who carries the 62.5kg after Leah Kilner's 1.5kg claim, and the Matt Dunn-trained Ten Taubada's ($2.30 favourite), who drops to 56.5kg after stable apprentice Emily Atkinson's 4kg allowance. Atkinson, having her seventh race ride, was successful on her first day of riding on Boxing Day, scoring at Ballina on the Dunn-trained Belle Of Cadiz. Tan Taubada's certainly looks one of Hope Island's toughest rivals, and Bowen is also wary of the Dunn stable in the opening event, the Lismore Turf Club Function Centre 2YO Hcp (1100m). Bowen will saddle-up first-starter Shoryuken ($5.50), a Fighting Sun filly, who has pleased the trainer on the training track. "She goes very well and I think she has a future," said Bowen. "I gave her an easy trial the other day at Grafton (January 27) and her work since has been good. But you always have to respect Matt Dunn's horses, and I'm particularly wary of that Snitzel colt (Cinco Star, $3.50) making his debut." Cinco Star, a $120,000 purchase at last year's Inglis Easter Yearling Sale, geared up for his debut with a Deagon trial win on February 5. Dunn also has Rubick colt Leshrac ($3.10 fav), lining up for his second start, running in the Lismore race. Jockey Robbie Fradd trialled both Dunn two-year-olds recently and will partner Cinco Star at Lismore. Bowen expects last-start winner Water Boy ($9) to race well again in Tuesday's final event, the XXXX Gold Benchmark 58 Hcp (1200m) for new rider Stephen Traecey. Matt McGuren has ridden Water Boy at his past three starts, but has elected to partner the Jim Jarvis-trained Impulsive Maneuver ($4.60 fav) in Tuesday's race. Water Boy is coming off a last-start Benchmark 58 win at Glen Innes on January 12 and will be even better suited on his home track at Lismore: "The track at Glen Innes was very hard that day and I've given him four weeks between runs," said Bowen. "He's racing well and has very good stats at the (Lismore) track and distance. He should race well again, but it just depends on where he ends up in the run from barrier seven. He's a funny horse - he can just 'switch off' sometimes and get too far back. "Matty decided to ride the three-year-old (Impulsive Maneuver), but I have no problem with that and Stephen will do a good job."